Probably the fall boot that I’ve worn the most consistently over the years and it’s having a moment this Fall. Fendi released a dream version for that sharp intake of breath reaction, but below are many takes that when styled correctly will be equally satisfying or at least close to it. Pair with cropped jeans like these from Mango, midi skirts or tuck slim cut trousers into them for modern I don’t give a c**p (but you do) take. If you can’t swing either of the above this category may be for you. The heel is reassuringly thick enough so no wobble factor and there’s a timeless retro nod that doesn’t feel too literal. Coming in tons of colours and price points, choose a pair that takes you from the creative office to the weekend. Don’t be afraid to wear them over slim jeans for a deliberate throw back take. Possibly the no.1 animal print of the season, the easiest way to partake is in boot form. 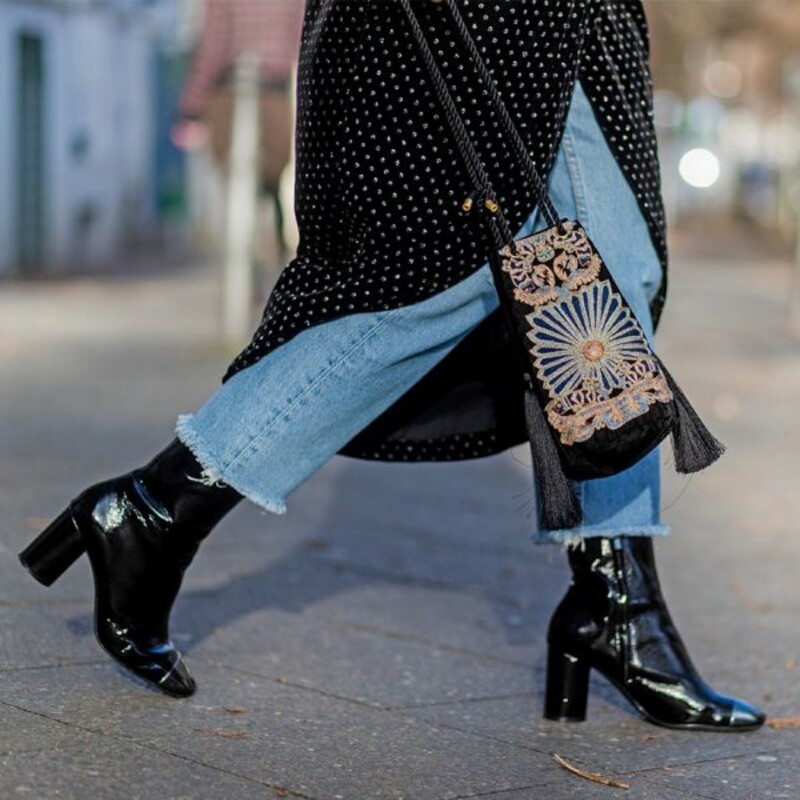 Choose from ankle to look at me tall versions and pair with solid colours like black cropped trumpet flare jeans, so the focus is all on the this fall boot. If feeling more advanced, mix them with a contrasting coloured coat. Everyone needs this fall boot regardless how experimental you are. I refuse to believe that means settling style wise, case in point with these By Far Becca boots. You should be able to wear them with everything and while being walkable for hours on end. Below are just a few that I classify as all day wearable while still making you smile when you look down at them. Let me know if this fall boot guide helps! 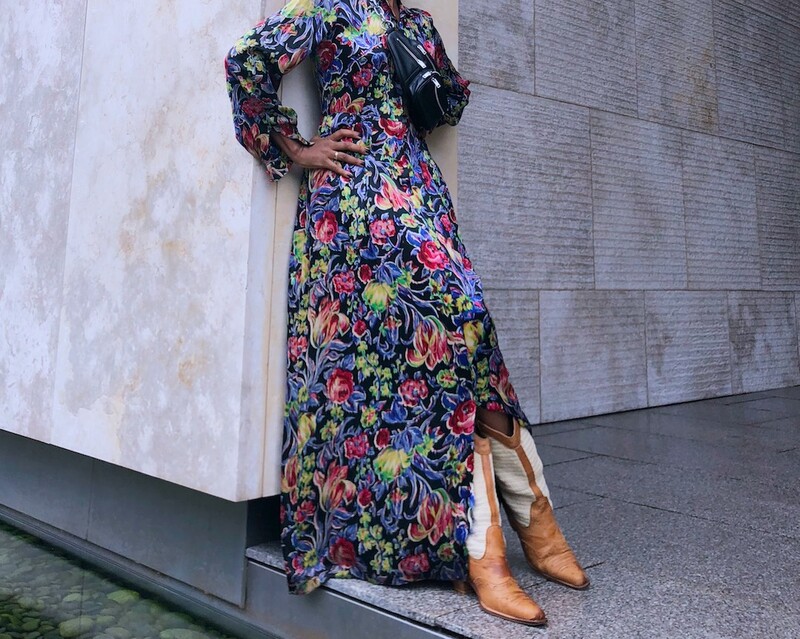 The post Your 2018 Fall Boot Guide appeared first on Where Did U Get That. When you kick off the holiday seasons meeting up with friends for a holiday lunch and decide to make an effort beyond jeans. This A.L.C snake print wrap dress with puff shoulders from Intermix had my name all over it. Casual enough but dressy enough at the same time. I clashed it over classic black slouch boots for exactly the same reason. I am already roladexing more ways to wear both as the holiday season gets going. ps. The dress has side pockets. You know how I feel about side pockets and to have it on a dress for possible party event rotation is about as dressy casual as it gets. The post Holiday Lunch For The Girls appeared first on Where Did U Get That. In a walk through sunny California, Selena Gomez demonstrated her ability to do edgy-chic, all while reminding us of our forever fondness of the band tee. She spotted a vintage AC/DC t-shirt with high waisted jeans and a pair of square-toe black ankle boots. This combo is Cali-cool, and we’re so into it. It can be tricky to purchase pieces during the holiday season. You may run through questions in your mind like, “Will I be able to wear this after Christmas?” or, “Will I have to wait until next year to style this again?” But, no. 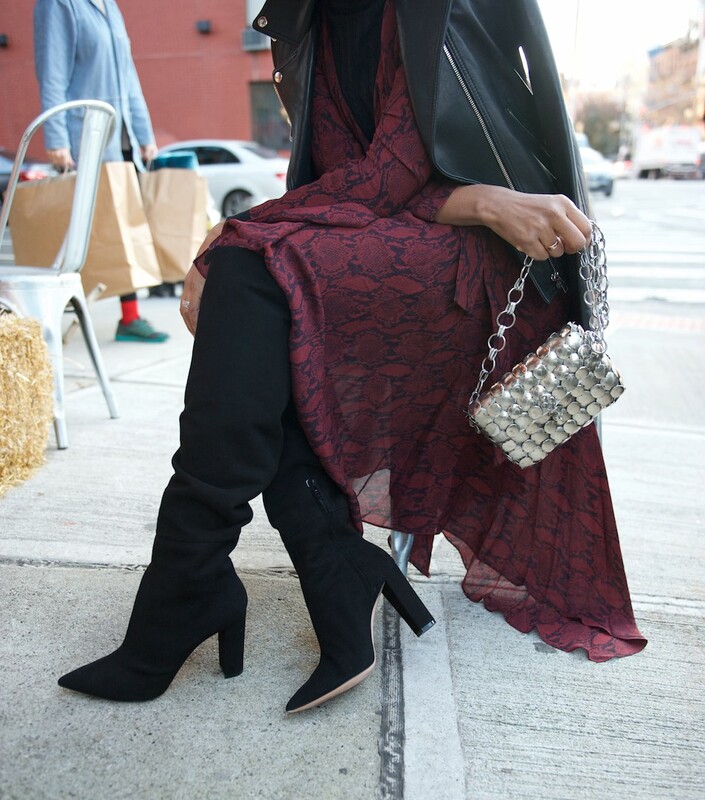 There are some pieces that when paired with winter staples can carry you through the entire season, holidays and beyond. Pernille (we’re all obsessed with her at this point) kept her outfit classic by pairing silver separates with a dark grey turtleneck sweater. The silver slip dress underneath and silver heeled booties are here to stay. For those who are still in love with the universal cool-girl uniform of head-to-toe black, fall and winter are the perfect opportunity to be darkly monochromatic. Aimee Song opted for simple but edgy in a black blazer, graphic t-shirt, ripped high-rise skinny jeans, and a pair of snakeskin boots to add some interest and a pop of pattern. Remember when wearing camouflage brought on various “Oh, I didn’t see you there” invisibility jokes and comments? Gone are those days now that major retailers, runway shows, and high street brands are modernizing the trend. Kaia Gerber is a lover of all things camo, proving this while sporting a cool camo jacket, leather leggings, and combat boots. She added oversized gold hoops and the ever-trendy beret for the ultimate cool-girl look. Our favorite fashion bloggers never fail to inspire us, especially as it gets colder out and outfits become more interesting. Case in point: Courtney Trop. She stuns in a white tie-waist shirt, a burgundy patent leather skirt, and a pair of heeled snakeskin boots. Often seen on Instagram in the teeniest of bikinis, supermodel Emily Ratajkowski has proven that she’s more than just killer curves and sandy beaches. On a cool London night out, she was spotted bundled up in the orange fur coat of our dreams. 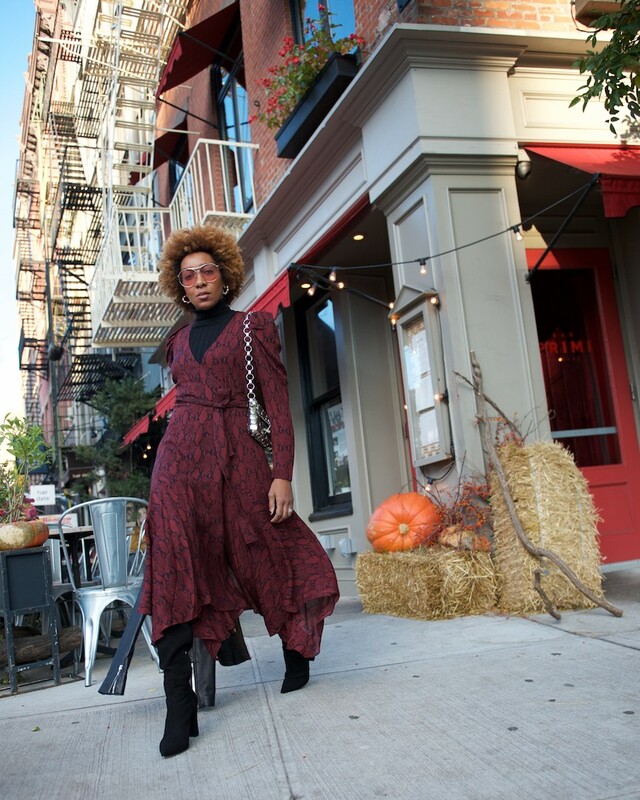 Instead of opting for a muted shoe, she boldly mixed our favorite fall tones together with a pair of ruby red heeled boots. As for underneath, the It girl kept it simple with a black top, and a polka-dot skirt. We’re sending well wishes to Selena Gomez after her surgery. Before the news broke, she was photographed in the coat of the season: an oversized, plaid, dark grey knee-grazing coat of our dreams. 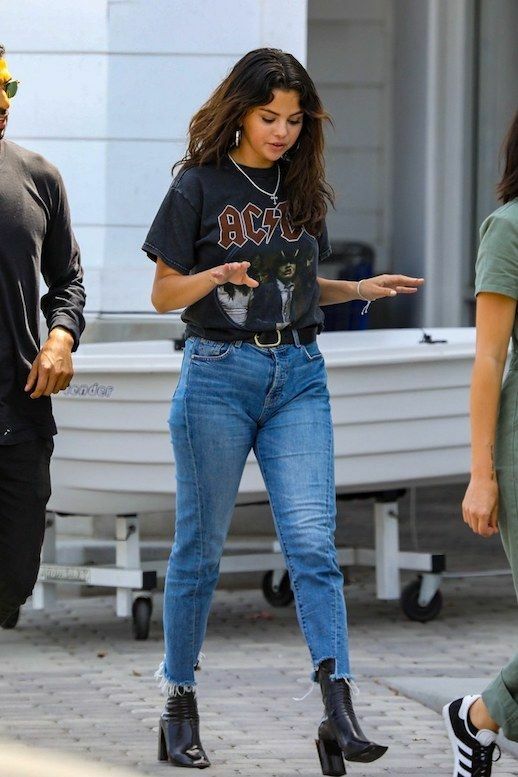 The style has recently been spotted on the street style circuit as well as Fashion Week runways, and Gomez pulled it off perfectly with a simple black t-shirt, raw-hem distressed jeans, and black patent leather boots. Our favorite up and coming model, Kaia Gerber, proves that any feminine little dress can be toughened up a bit when paired with the right pieces. She wore a low cut, polka dotted skater dress with black combat boots and round sunglasses. We’re digging the juxtaposition. It’s still chilly out, but no need to sacrifice style. Here’s a crazy cool black and white street style look that we can’t wait to copy this season. I’ll get this out of the way first: Â I smashed my camera and lens. Â If you saw myÂ Instagram stories then you already know what happened about five minutes into taking theseÂ photos. Â Just imagine: a windy day and a tripod – you know where this is going. Â I take my own blog photos and the tripod, camera and lens suddenly capsized in a gust of wind and smashed on the ground. Â I couldn’t run fast enough. Â My lens is in two pieces and is going to a repair shop on Monday and the camera miraculously was fixed by my husband Michael (God knows how he managed it). Ok so that aside, Â I have to say I’m splitÂ dress wise (aren’t we all?). Â On one hand I’m itching to wear the spring pieces that have started worming into my wardrobe. Â On the other this is the last month of extreme temp fluctuations and so the last few weeks to rotate inÂ big coats (we hope). Coat: H&M. Â Bag: Â Gucci (yes I finally caved after a full calendar year of try ons). Â More embellished bags: MangoÂ and Topshop.Â Â Jeans: Zara. Â Try AsosÂ or JBrand.Â Â Boots: Zara. Â Try these similars from TopshopÂ (also comes in black). Â Hat: H&M. Â Try Shopbop. Shades: Ray-Ban foldable wayfarers. Spring is in the air. I know, I know. There’s still snow up North and frail, brown plants everywhere else (except California of course) but it’s March already and the sun is peeking out from behind the clouds. In order to prepare you for the upcoming season, you’ll need a few pieces. Don’t fret! These are all affordable and all on trend. Below you can check out 10 items, from blush bomber jackets to the perfect pair of cropped jeans, to get you ready for Spring.